The newly developed cylinder of the 250 SX - with a bore of 66.4mm - has all-new ports and is fitted with an overhauled power valve system. This system features a sophisticated mechanism for the lateral support exhaust ports, providing smooth and controllable power on tap. Furthermore, it’s possible to change the bike’s power delivery in seconds thanks to two supplied powervalve springs. Limitless settings for different tracks and preferences are up for grabs. Throw everything you have at it; new water jackets in the cylinder and head will take care of excess heat and reworked lateral cylinder head brackets allow a more efficient fixation of the engine to the frame via lightweight head stays. Yes, this is a serious piece of kit. These all-new die-cast engine cases feature an 4mm higher clutch shaft and a 19.5mm higher crankshaft, resulting in better mass centralization and quicker handling. In addition, it allows the implementation of a counter balance shaft. So your ride will be as relaxed as it is rapid. Plus, your new favorite engine will keep looking as fresh as the day you bought it with redesigned engine covers featuring a smart surface structure in order to reduce the wear caused by the rider’s boots. 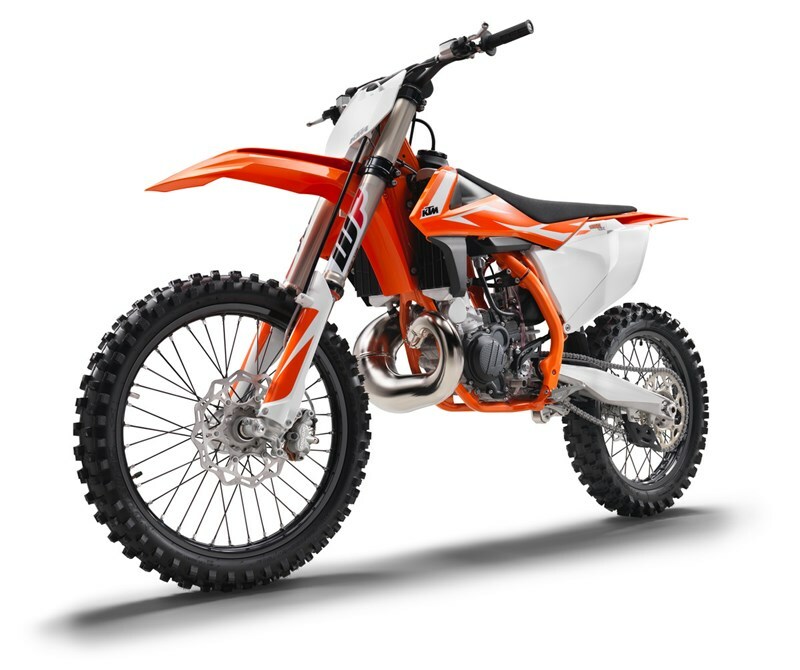 The 250 SX employs the KTM-developed DDS clutch (damped diaphragm steel) with a wear-free steel basket and extremely heat resistant clutch plates. This clever design employs a diaphragm spring instead of the usual coil springs, making for considerably easier clutch action. A diaphragm spring also leaves sufficient space for a damping system to be integrated into the clutch hub. The goal is traction, but durability is as well. A lighter basket, a reworked inner hub and a pressure plate providing better oil supply and unsurpassed cooling up the longevity of the DDS clutch. Light operation and telepathic amounts of control are standard with this hydraulic Brembo actuated clutch. A robust 5-speed transmission, its gear ratios perfectly in sync with the 250’s power band. An advanced ´No Dirt´ gear shift lever design prevents mud and sand from jamming the joint of the lever and guarantees trouble-free shifting. The engineers meticulously tuned the resonator chamber for maximum torque and power, so this screamer is as tough as it is strong. Its 72mm stroke is the same, the rest is brand new. The 250 SX’s crank has been rebalanced, revamped and set-up with a counter balance shaft to kill vibrations, not your vibe. The KTM 250 SX is fitted with a MIKUNI TMX carburetor. This 38mm flat slide carb lives to provide smooth and controllable power all the way up to the rev limitation. With a new intake manifold the carburetor is turned 7° in order to reduce the overflow of fuel. And it’s less sensitive to different altitudes and temperatures, so you can pin it wherever, whenever. The high-tech, lightweight chrome-moly steel frame has a knack for easy handling, outlandish rideability, precise cornering and excellent stability. You can also count on high torsional rigidity and low longitudinal stiffness. This results in better absorption of the energy created from the front and rear suspension, sucking up jumps and bumps. In short: more comfort and less rider fatigue. Laterally attached, lightweight aluminum engine head stays (the connection between cylinder head and frame) contribute to precise cornering and a reduced vibration level. The engineers were able to pull off all that, while making their frame 2.2 pounds lighter than that of the lightest competitor on the market. In addition, it is easier to maintain, easier to work on and supplies more space for the tank and other components. The bike also features an extra-light subframe made of aluminum, which tiptoes the scales at less than 2 pounds.